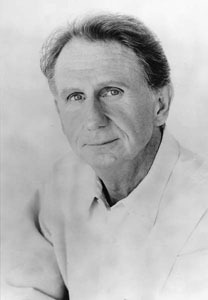 René Auberjonois (pronounced "awe-burr-zhun-wah") has been a successful character actor since the 1960s. He is best known as the Governor's fussy chief of staff Clayton Endicott III on Benson with Robert Guillaume, the shape-shifting security officer Odo on Star Trek: Deep Space Nine, the stuffy lawyer Paul Lewiston on Boston Legal, and as the voice of the ever-calm Master Fung on the cartoon Xiaolin Showdown. His father, Fernand Auberjonois, was a well-known journalist who wrote for the Pittsburgh Post-Gazette, Toledo Blade, and NBC News, covering everything from the construction of the Berlin Wall in 1961 to its demolition in 1989. In World War II he was a spy for the British intelligence service, sent on several missions behind enemy lines, and he later wrote for La Presse Cherbourgeoise, the first newspaper published in liberated France. The actor Auberjonois was named in honor of his grandfather, René Auberjonois (1872-1957), one of Switzerland's most famous post-impressionist painters. On his mother's side, Auberjonois is descended directly from Joachim Murat, King of Naples in the early 1800s and brother-in-law of Napoleon Bonaparte. The family moved frequently, relocating whenever the elder Auberjonois was given a new assignment. Young René spent his early years in France, England, and in an upstate New York artists' community where the family's neighbors included Helen Hayes, Burgess Meredith, and John Houseman. In his first professional theater work at the age of 16, Auberjonois was credited as "spear carrier" at Houseman's Shakespeare Festival. He studied drama at Carnegie-Mellon University, then spent three years with the Arena Stage in Washington D.C. before moving to San Francisco, where he co-founded the American Conservatory Theatre. He first worked on Broadway in a 1968 production of King Lear with Lee J. Cobb, and won the Tony playing a fashion designer in the musical Coco with Katharine Hepburn. His first movie work was a small, uncredited role in 1964's Lilith with Warren Beatty and Jean Seberg, and he later played Father Mulcahy in Robert Altman's MASH. In other memorable performances, he played the ornithologist who gradually became a bird in Brewster McCloud with Bud Cort, the insane psychiatrist in Batman Forever with Val Kilmer, the military officer who tried to derail the peace talks in Star Trek VI: The Undiscovered Country with William Shatner, and Janos Audron, the vampires' holy weapon in the "Legacy of Kain" video games. He turned down two iconic television roles, Father Mulcahy on TV's M*A*S*H and Bosley on the original Charlie's Angels. Auberjonois is a frequent volunteer for Doctors Without Borders/Médecins Sans Frontières, the humanitarian group that provides emergency medical care in underdeveloped nations. His son Remy is a regular on Weeds, and his daughter Tessa is a stage actress.